These four key elements represent both the essence of our business philosophy and the strong base upon which we have built our company. 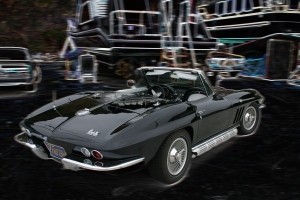 EC Products is much more than a Corvette parts supplier. It is a group of talented individuals who have pooled their skills and expertise as a means of bringing more than 1,200 dealers an inordinately high level of service and knowledge. Our goal is to not only provide dealers with highest quality parts and innovative products, but also with a selection that reflects the very best price-performance in the Corvette aftermarket today. No new product is taken on face value; each is thoroughly tested by us to determine that the product will meet the most stringent standards of long term usage. We stand behind our products, and that is why they are subjected to the seemingly endless rigor of tests that include shocking, dropping, heating, vibrating and other 'torture'. These efforts have earned us an industry-wide reputation for quality and reliability. Innovation. Value. Customer Service. These are the true signatures of EC Products Design, Inc. They are what our products stand for and what our company stands for as well. We are justifiably proud of what we sell, and also proud of our trained, efficient, and knowledgeable staff, who are there to answer your questions, provide technical support, offer advice on choosing and installing our products, and to ensure that your business experience with us is first-rate, this time and every time. But we don't stop there. We back everything that we sell with our Guarantee of Quality, and we only feature products that are constructed from the highest quality materials available today. Each product is carefully assessed to ensure that it is offered at the most reasonable price, and for every product we offer a liberal 30-day return period. Your satisfaction is our only goal. Please visit our Policies page for further information on purchasing options and our Guarantee of Quality. We strive to bring our dealers the highest quality after-market and replacement parts. Every single selection in our catalog has been carefully scrutinized to meet our exacting standards. I have been involved in complex, uncompromising restoration projects for nearly 25 years, and, while I may not need everything presented in our catalog for a specific project, I can assure you that not a single selection was made for our parts inventory that I would not personally feel confident using myself. EC Products Design, Inc. will always be working hard to be your choice for quality Corvette parts and accessories. Please feel welcome to call me personally with your questions or comments. WARNING: Some dust and particles created by power and hand tools from cutting, sanding, sawing, grinding, drilling and other activities contains chemicals known to the State of California to cause cancer and birth defects or other reproductive harm.